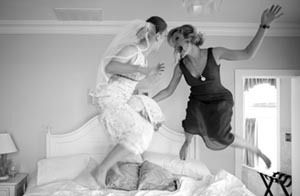 Many brides belive that by hiring a wedding coordinator will make things run very smoothly. It is true sometimes but more than likely wedding corrdinator aren't as useful as brides might think they are. Be careful who you hire and how much you pay. Having said all this I have seem some good wedding coordinators and I personally don't have anything against them. Just don't overpay and overestimate as to what they can do. You only have one and only one wedding day. Don't waste half your morning getting hair and make up done. Schedule your hairstylist and makeup artist to show up as early as 7 or 8:00AM. If they cannot guarantee your hair will last all day then get somebody else. If they know what they are doing then your hair should last until midnnight. If you have family members that you know typically run late in your immediate or extended family, be sure to give them a 30 – 45 minute buffer. For example: Tell family members to be there at 4:15 if their scheduled picture time is 5:00. Be sure to give them accurate directions. Another special thing to do that will also assure that everyone is informed on picture times is to send a personal note, e-mail, and or phone call to each member saying something like, “We really love you and care about you, and want you to be a part of our special day…Here is the time, place, and accurate directions to get there.